Alicia Whitney and Alexander Dale, the team behind Huntington Beach SeaLegs Wine Bar, has a new Huntington Beach haunt called SeaSalt Woodfire Grill. The restaurant’s appeal is evocative of the Old West dining experience in California’s Santa Maria Valley, with the decor featuring beef-cut charts on the walls and a pit master grilling tri-tip steaks over red-oak wood. 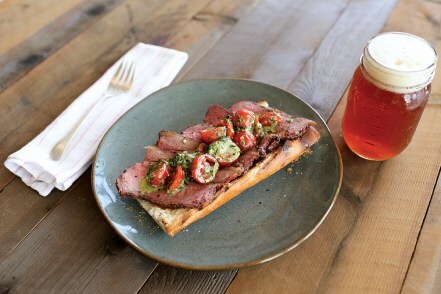 Expect Santa Maria-style barbecue, house-made flavored sea salts such as Alae volcanic red salt, and Meyer lemon and thyme, and dishes such as grilled cauliflower with manchego-cheese fondue, or the Santa Maria tri-tip sandwich, above. Also on the menu: smoked albacore banh mi, spicy linguica sausages, spencer steak, and sea-salt cocktails such as the Salty Hog with vodka, grapefruit, and bacon. Prices range from $6 to $70.